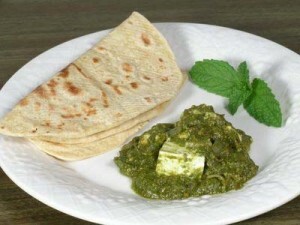 Palak Paneer recipe by Ghazala at DesiRecipes.com. Chop spinach finely, add cup water and soda bicarbonate, cook till done. Blend in a liquidiser and leave aside. Cut paneer into cubes and deep fry them, after frying set them aside. Fry chop onions, ginger & chillies. Add turmeric powder and fry again. Add the spinach , cheese and salt , cook for 5 to 10 minutes. How much cheese and turmeric powder???????? ?